Any antioxidant glutathione in BAC? ” Dear Roland, I am now on my fourth bottle of the bio-Algae and still taking nine capsules a day, as you advised. The eye doctor checked the pressure for the glaucoma yesterday. I was most curious to see if there would be any difference since taking the BAC. The pressure in my right eye (which they have been unable to bring down for years) has dropped from 16 to 11. The left eye is even a bit lower!! Even more strange: I noticed that the vision in my left eye had improved…..I have a few blind spots from the glaucoma, and when I read the chart it find that every third letter in a line is a total blur. This time I was able to read many more letters. I am really happy about it and now feel justified in spending that much every month! Thank you again so much for all your help and advice. I am still very happy with the eye pressure with my Glaucoma. I might also mention that I think you may have discovered the Fountain of Youth! On my fourth or fifth bottle of supplements, I have noticed a remarkable improvement in my skin……especially on my hands which have been severely chapped ever since I was a child. Over the last few months, we have received several testimonials relating to eye health from people consuming BioSuperfood. In this BioNews I include updates made at Page 27.01 of The Magic is BAC with “Seeing is believing – Visual health with Bio-Algae Concentrates”. Good vision and eye health are a concern for both young and old. 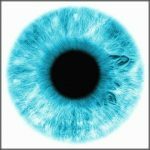 Blurred vision, eye strain, and irritations are just a few of the complaints that have been reported in eye fatigue and in some serious cases, cataracts and age-related macular degeneration (AMD) develops because of degenerative cellular health and accumulated free radical damage in our lifetime. To date the known antioxidants have been defined rather ambiguously, and yet there are thousands more being isolated – and more being discovered constantly. Antioxidant research is one of the pillars in the study of life extension and general health. Some antioxidants have merited greater scientific interest than others; for example, R(+)-lipoic acid and full-spectrum Vitamin E, among others. Not only have these antioxidants served us well (and will continue to do so), they belong to an elite category distinguishing them from other antioxidants due to their unique properties, mechanisms of action, central importance and/or exceptional potency. So why do some of the antioxidants in Bio-Algae Concentrates merit admittance into this exclusive category? In the context of eye health, there are only three certain carotenoids that are known to transverse the blood-retinal barrier (BRB); lutein, zeaxanthin, and astaxanthin. And Bio-Algae Concentrates contains these three and many more known beneficial carotenoids and many not yet identified. While lutein and zeaxanthin carotenoids may help reduce the risk of age-related macular disease in the elderly, astaxanthin has been shown to additionally help the ciliary body in the eye. These are tiny muscles which control the lens of the eye from harmful oxidative stress. Astaxanthin is found in abundance in marine environments, particularly among algae, planktons, while the pink and red color of salmon, shrimp, and lobster is attributable to the astaxanthin-rich diets of these animals. The highest level of astaxanthin on earth is found in the algae Heomatoccocus Pluvialis an important component of BAC. Astaxanthin is a member of the xanthophyll subcategory of carotenoids – organic pigments that occur mainly in plants. Astaxanthin has a unique molecular structure: its polar end groups have the distinct ability to attach themselves to both sides of the lipid bilayer that contains the cell membrane. 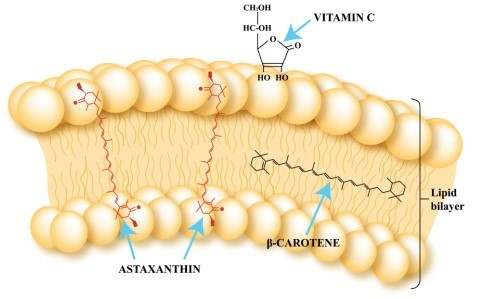 From this entrenched position, astaxanthin inhibits the lipid peroxidation of the cell membrane (which is the ‘gatekeeper of the cell – controlling what comes in and out), by extension protecting the mitochondria and the rest of the cell from potentially damaging peroxidation. Astaxanthin can also quench free radicals by adding them to its structure rather than sacrificing an atom or electron, meaning that unlike most antioxidants, astaxanthin is far less likely to become a mild free radical in its own right after quenching one. This also allows astaxanthin to be more biologically active, enabling it to trap and quench more free radicals – and of a greater variety – than most other antioxidants. Astaxanthin’s fat-solubility and low molecular weight (less than 600 daltons) allow it to effectively cross the blood-brain barrier to alleviate oxidative stress in the eyes, brain and central nervous system. Particular focus has been paid to astaxanthin’s effect on ocular health, with several Japanese studies examining its ability to alleviate the symptoms of asthenopia (eye fatigue). This increasingly common condition is often caused by overexposure to visual display terminals (VDT’s), and the aforementioned human studies revealed that astaxanthin can alleviate asthenopia symptoms by more than 50%. Many scientists believe the mechanism of action for these benefits is based on the increased ciliary body accommodation, increased retinal blood flow, and anti-inflammatory properties associated with astaxanthin supplementation. The ciliary body is composed primarily of an ocular muscle that stretches across the vitreous humor between the lens and the pupil. Accommodation refers to the ability of the ciliary body to manipulate the thickness of the lens in order to focus light on the retina. If the eye is required to focus on a fixed object for extended periods of time, muscle spasms and other signs of fatigue may occur. Factors such as the speed at which the ciliary body reacts to a change in visual focus are used to evaluate improvements (if any) in the accommodation response. Two studies conducted in 2005 determined that the speed of the ciliary body’s reactions in the astaxanthin group were approximately 46% faster than those in the placebo group. This means that those taking astaxanthin were able to spot moving objects that much faster than those who were not. Furthermore, another placebo-controlled study determined that astaxanthin can increase retinal blood flow by approximately 11% (nourishing ciliary muscles) while yet another study (with laboratory rats) found that astaxanthin can reduce ciliary cell inflammation by nearly 80%. In another separate double-blind randomized placebo-controlled study, 20-year-old men specialized in handball, received an oral dose of 6mg astaxanthin per day during a period of 4 weeks. In sports vision, depth perception and critical flicker, a fusion of 46%, respectively 5% was reported. Based on these preliminary studies it is shown that astaxanthin may be effective for improving vision in sports. In ending, let me remind us all that BAC is much more than just antioxidants. I have personally more faith in “BAC awakens the genius within” then in its antioxidative powers. I believe that when our cells recover from exhaustion, that they can perform their metabolic activity better; growth, repair, detoxification, and regeneration. Is there any antioxidant glutathione in BAC? I assume here that this question is inspired by the glutathione deficiency theory and those that have a supplement just for it. This theory proposes that “by providing a supplemental mega dose of the amino acid cysteine from pharmaceutical-grade milk serum protein isolates, this will allow cells to synthesize and replenish their glutathione stores”. What is not shared with this theory are other relevant facts, for example; many other foods or lifestyle changes will stimulate glutathione production; a simple jog and a good meal will stimulate glutathione production too; meditation and a good salad will do too; that no one stimulant can take credit for natural human metabolisms. Glutathione is produced in the human liver and plays a key role in intermediary metabolism, immune response, and health, though many of its mechanisms and behavior await further understanding. It is also known as gamma-Glutamylcysteineglycine and GHS. It is a small protein composed of three amino acids, cysteine, glutamic acid, and glycine. Glutathione is found in two forms, a monomer that is a single molecule of the protein, and a dimmer that is two of the single molecules joined together. The monomer is sometimes called reduced glutathione, while the dimmer is also called oxidized glutathione. The monomer is the active form of glutathione. Oxidized glutathione is broken down to the single molecule by an enzyme called glutathione reductase. In response to the deficiency theory; a typical capsule of BAC contains ~50% of amino acids comprising all known amino acids, including cysteine. More importantly, BAC is a holistic approach “aimed at the whole being” (nourish all cells of the body) rather than a palliative approach “aimed at the symptom/deficiency” (cysteine to stimulate glutathione). BAC nourishes/stimulates efficiently all the cells of the body including those of the brain glands which in turn increase all metabolisms of health in the body including the production of glutathione at the cellular level. In ending, let me point out that when BAC is fed to dairy cows (and other species) it allows them to reduce their daily protein (amino acids) need by 1.25lbs while increasing productivity by ~20%. That is due to better protein uptake and more importantly better protein synthesis and utilization at the cellular level. It is smarter to stimulate the producer glands of the brain rather then supplement all the deficiencies of the body; you will soon be taking hundreds of supplements if you fall for each deficiency theories.